When a bunch of us got together to celebrate Bastille day this year, we decided to make it a grandiose affair. Also known as La Fête Nationale or the French National Day. Whilst the date (July 14th) coincides with the storming of Bastille, the French National Day instead, commemorates the short lived constitutional monarchy in 1790. For this occasion, each one of us would attempt a classic French recipe to showcase and share with the gang. The Boy and I couldn’t decide on what we would bring to the party. So we made a dish each (naturally). The Boy cooked the savoury dish and I cooked the dessert. Here is the first of the two dishes we brought to the party. 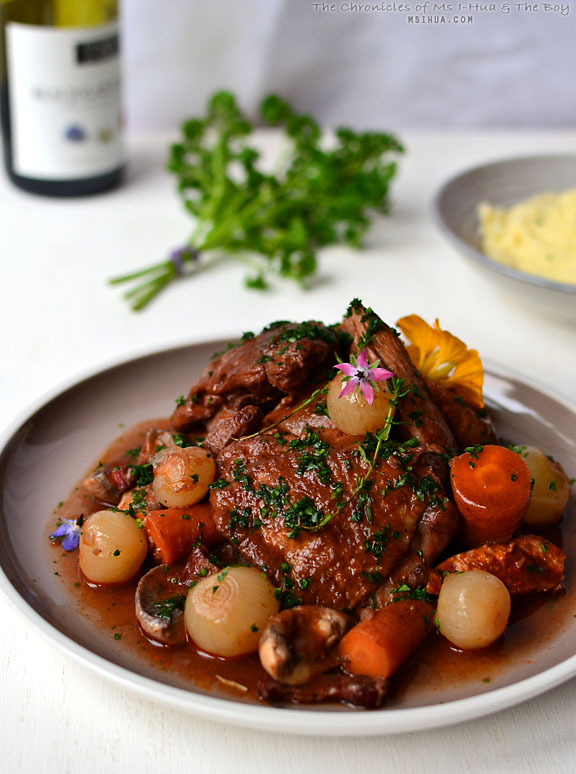 Slow Cooked Coq Au Vin otherwise known as slow cooked chicken in wine 😛 The twist with this recipe is the use of Beaujolais instead of the usual Burgundy wine (which is the region where this dish is said to have originated from). The other ingredient we have used in lieu of a rooster (or cockerel) is the chicken. We brined the chicken pieces overnight (6-8 hours) in the refrigerator. This step can be skipped if you do not have the time. Wash off the brine from the chicken pieces under running tap water and pat dry. In a large pan, heat olive oil on medium heat and fry the speck batons until most of the fat is rendered. Transfer speck to a bowl. In the same pan (on medium heat), brown the thighs, drumsticks and wings on both sides. This should take about 3-4 minutes each side. Remove chicken pieces. Place chicken breast (skin side down) in the same pan and fry for 2 minutes and remove. Transfer fat from the pan into a separate bowl (for the slurry) but keep at least 2 tablespoons of it in the pan. Return the pan to medium heat and add chopped onion. When the onion starts to soften, add in garlic and cook until fragrant (careful not to burn the garlic). Pour in the Sweet Sherry and start deglazing the pan by scrapping off the fond at the bottom of the pan. Once most of the liquid is evaporated, add in the Beaujolais wine, chicken stock, thyme, bay leaf, carrots and tomato paste. Simmer (low heat) for 5 minutes. Place chicken pieces and speck into the slow cooker. Pour contents from the pan into the slow cooker, making sure that the chicken pieces are covered with liquid (add more chicken stock if required). Cook on low for 4-5 hours (or until meat is very tender). Add in pickled pearl onions and mushrooms at the last hour. Transfer chicken pieces, speck, pickled onions and mushroom from the slow cooker to a dish and cover to keep warm. Strain your stock from the slow cooker through a fine sieve and discard any herbs, chopped onions & garlic. Heat the stock in a pan (on medium heat) to reduce it a bit. Using the fat kept earlier, mix 2 tablespoons of fat with 1 tablespoon of flour to make your slurry. Add 1 teaspoon of slurry at a time and stir into the sauce. Do this until you are happy with the thickness of the sauce. If you prefer a thicker sauce, keep adding more slurry but keep in mind that you might not have enough sauce to cover the chicken. Once the sauce is done, return the chicken pieces and other ingredients into the pan to reheat and coat with the sauce. Season with salt and pepper. 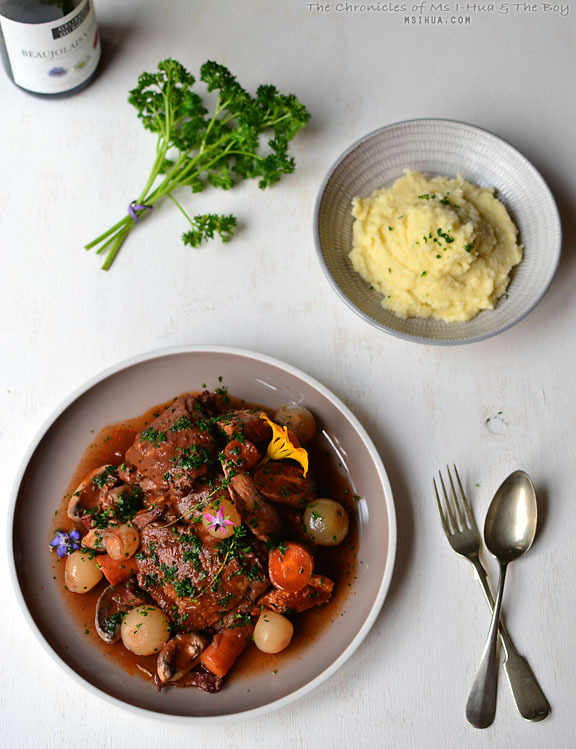 Serve your Coq Au Vin with warm mashed potatoes. Adapted from Gourmet Traveller's Coq Au Vin (http://www.gourmettraveller.com.au/recipes/recipe-search/drink-suggestion/2007/9/coq-au-vin/) recipe and modified by The Boy. Everything in this dish was succulent, tender and bursting with flavour. This is such a traditional French dish 🙂 But so comforting and yum! Sad I couldn’t go to that potluck everything looked so nom nom! I’ve never actually been all that interested in Coq Au Vin but I must say looking at this I’m not surprised it almost all went. The Boy certainly has some plating skills!! Wah you all really power. 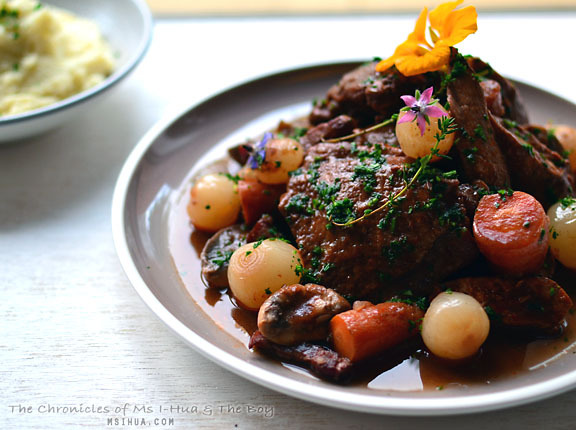 Can make the coq au vin look so pretty. Not that I bothered trying mine looked like food splattered on a plate lol. But at least it was yummy haha! At the end of the day, it’s the taste that matters! I’d love to go to one of your dinner parties- especially with such great classic dishes, yummo! Super impressed that you guys can cook this dish AND make it look so gorgeous in the photos! My photos of dishes like this always look like…… reddish brown globs 🙁 Cheers! so purty! Love a slow cooked coq. This looks so good. Can I use my new induction cookware for this? Oh my.. I have no idea. Best to check with the experts! 되게 맛있어보이고 사진을 이쁘게 잘찍으셨네요~!